In this workshop Artist and Actor Pablo Gershanik (Buenos Aires, Argentinien) and psychologist Frauke Nees (Berlin) will work together, connecting the two worlds of arts and psychology. Playing with masks will transform people to get into the body and into the role of somebody else. Expressing and experimenting with different roles, archetypes and inner parts helps people to break with patterns and leave them behind, creating new forms of being by living it. 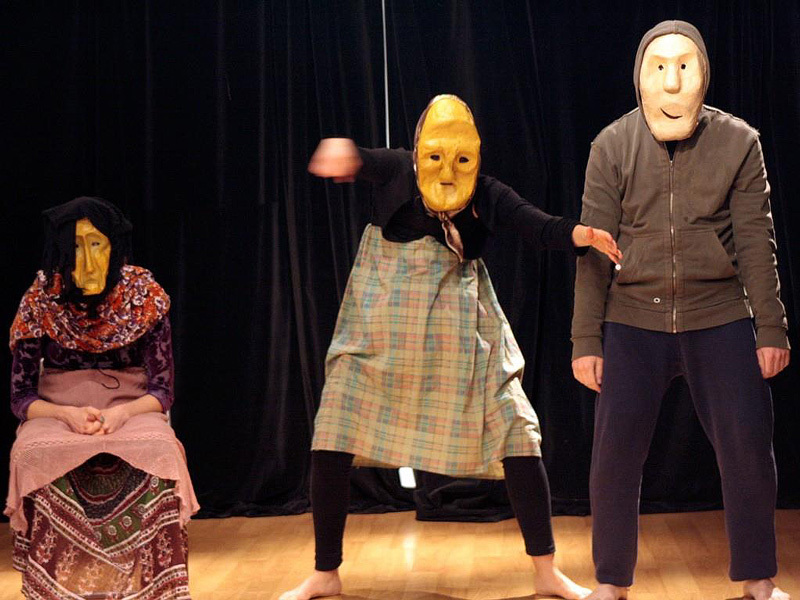 Working with masks means not being able to express yourself through two important ways: language and facial expression. Body and physical expression will be even more important. A mask shows more then it´s hiding. Precisely, from masking, from veiling certain aspects of ourselves (the face in this case), the possibility of recovering one's expressive territory becomes more fluid; the symbolic universe of the person, his images and these as the motor of any creative or transforming act. We are the images that we nest in our heads, the images of us and of the world that surrounds us, the scenes we are able to dream. If we can not represent it, we can not understand it either, go towards that we seek to be. Imagination as the capacity to open to new possibilities and not to do the same again and again. It´s the capacity to proyect yourself into the future. You can only do new things if you can imagine it (Van der Kolk). Further aims: Resilience, feeling of belonging, self-regulation, strengthen your identity, self-esteem, self-confidence, self-awareness, self-expression, flexibility, spontaneity, self-efficacy. He studied Dramatic Art at the Theatrical Studies Center in Mexico City. He specialized in physical theater at The Desmond Jones School of Mime and Physichal Theater in London and at the École Internationale de Thèâtre Jacques Lecoq in Paris. His teachers are: Raúl Quintanilla, Eugenio Barba, Mauricio Kartún, Rubén Szuchmacher, Emilio García Wehbi, Norman Taylor, and Philippe Genty among others. For the past 25 years he’s been working as a theatre director, as well as teaching acting, physical theater and clown in places such as the Mexico’s National Film School, La Arena Circus School, the National University of Art (IUNA) and the Rolling Art Program of the Ministry of Education of Argentina; the degree in Theatre, Puppets and Objects of the National University of San Martín (U.N.S.A.M), the International Union of Puppeteers (UNIMA), among others. He currently works as a professor of the degree in Performing Arts at the University of San Martin (UNSAM), Director of the Diploma in Performance and Interpretation with Masks of the National University of San Martin (UNSAM), the Department of Dramatic Arts of the National University of Arts (UNA), the Performing Arts Degree of the Argentine University of Business (UADE), the International School of Theatrical Creation CABUIA and in his own school: Estudio Gershanik.